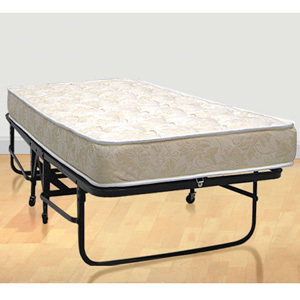 Complete Metal Folding Cot With Springs And Premium Foam Mattress. Spring Mattress available at extra cost. Special Ball-Bearing Wheels included. No assembly required. Available in 30, 39 and 48 In. Size. with 4 In. or 5 In. Mattress. The quoted price is for the 30 In. model with 4 In. Foam Mattress. For prices on the other models please see the option below. Vinyl Anti Static Mattress Protection is available at extra cost. Cot Size Dimensions: 30 In. x 75 In. Frame. Small Full Size Dimensions: 48 In. x 75 In. Frame. The height from the floor to the top of the mattress is approximately 20 In. * Mattress Size is the Same as the Frame Size. The Bed is shipped fully assembled except the wheels need to be hand screwed in the housing. The Weight Capacity Is 285 lbs.